After having crossed the Cambodian border, we have arrived in Kampot, a small town in the south of the country. 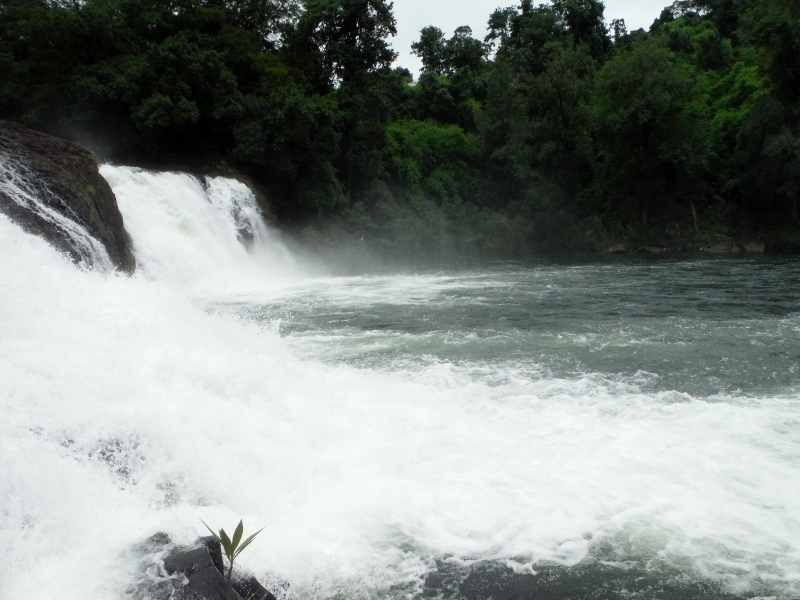 Kampot is known for its pepper plantations, Bokor national park and its beautiful sunset river. We decided to do a stop for 2 days in this nice spot to take the temperature of the country as well as to be ready for our next adventure in the jungle in Chi Phat. Our first impressions of Cambodia are good. People speak Khmer. 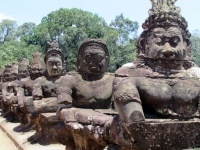 The majority of Khmers follow the Buddhism. Their past has been bright but dark at the same time. Things were good in the early years, the period after 1953 was a time of peace and creativity. The capital, Phnom Penh grew in size and the Angkor temples were a famous destination for tourist.However, as the Vietnam war began, Cambodia got sucked in neighboring countries. North Vietnam and the Viet Cong were using Cambodian territories in their battles against the south and many part of the country got invaded. In 1979, the prime minister Sihanouk left for China which was a kind of exile, letting the space for the Khmer Rouge party which is known for a radical governance. Pol Pot leader of the party, drove the country into a dominant cooperative that was seen as a extreme Maoism. Cambodia became a vast slave labour camp from 1975 to 1979 until Vietnamese came to put an end to the Khmer Rouge rules. Indeed Cambodia has a difficult past where the food was not always available. I guess it stayed in their blood and now it is totally normal to eat dogs, crickets, duck embryo, fermented fish paste and grilled Tarantulas ! While studying this country in more details in Kampot, we planed our next destination to Chi Phat. It is the home for eco-tourism based in the cardamoms mountains. This remote small village has a lot to offer in term of eco-activities such as sunrise bird watching by boat, mountain bike tours and trips in the jungle from 1 to 6 nights. We kind of needed to have some action and were eager to discover the Cambodian jungle ! Being one of the poorest country is Asia, Cambodia has given us a good transportation system so far. Roads can be unpaved sometimes but still smooth. We took a mini van from Kampot to Andoung Tuek. 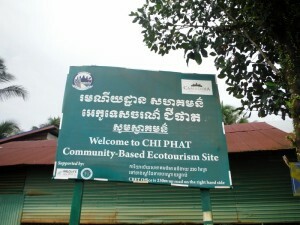 From there, we did a 2 hour boat ride to get to the Chi Phat village and their Eco-tourism Center. It has been very easy to plan the boat ride and accommodation as they do everything for you via email. Chi Phat village is to sum up a good place to be into the wild and back to the basic comfort. It is actually very interesting to see people very happy with almost nothing. They live in wood houses with electricity from 5 to 10 am and from 5pm to 11pm! No TV during the day or internet. So then kids play on the street with the doggies, young men play volleyball, go fishing and women cook, take care of the children or speak with the neigbours. Everybody knows everybody and there is always someone here to help in case it is needed. It is a big community based in the jungle far from the buzzing life of big cities. The first evening we had a really good time speaking to people having made some trekking during the day and get to know about the activities and tours we can do. We decided to book a mountain bike tour in the jungle and waterfalls for a full day. As the power is off at 11pm, we had a good night sleep that evening to be fully ready to take on a new adventure the day after. We met our guide that basically showed up with flip-flip and a very basic outfit. Maybe we shouldn’t have brought our rain jackets, trekking shoes, headlamp, and other material ? Well, it was too late to go back to the bungalow anyway. We took off for a ride in the jungle that at first was quite easy but that became quite of an experience. We went through very small paths in the jungle, with some time almost no roads or totally flooded. We are not horrible bikers but we felt down quite a lot of time..! Our clean trekking shoes became very quickly dirty and muddy. Our guide still had the flip flop and nothing on it.. clean ! We kept biking through some lands and jungle until we got to a majestic waterfall. The scenery with the jungle behind was absolutely stunning. Our guide took a swim in the water. We wanted to do so but we finally didn’t.. We had maybe too much mug on us. How are you? : Sok sa bai ? We have 2 excellent restaurants in Kampot to recommend which are : La Java bleu for some good French dish and fish as well as the Rikitikitavi restaurant for traditional Cambodian dishes. 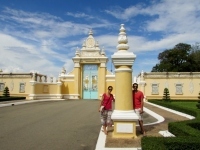 The Green House (1hour from Kampot on bicycle) is worth the visit. To go to Chi Pat from Kampot, local buses usually depart in the morning. Hotels and tourism offices have timetable or can organize minibus (around 13$). Then the Chi Phat office organize a boat ride (around 10$) to the village from Andoung Tuek village. All Info are here.